A recent news broadcast on television showed what happen to a pet in an automobile accident. It was a dog who was travelling in the back seat without proper harness and the dog flew onto street crashing through the windscreen due to the impact of the accident. Fortunately he landed on the shoulder of the road with minor injuries but with lot of shaking due to the shock. There are safety measures that you can take protect your pet when traveling with you. Your pet should be confined to the back seat area. It reduces the chance of him distracting you while driving and limit his mobility. Make your pet comfortable. Have enough room for your pet to move. Give him his favorite toy or blanket to play. In order to prevent car sickness open windows few notches down. Make sure he can see through the front windscreen. Make sure to order him to stay in one place. 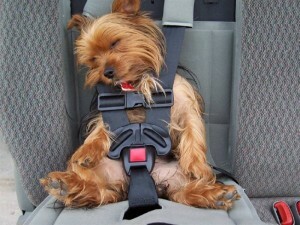 In order to provide proper safety for your pet buy a safety transport harness for your pet. Maintain a comfortable temperature inside the vehicle for you and your pet. Keep in mind that inside temperature is always few degrees higher than the outside.